As noted above, smooth muscle cells may remain contracted for long periods of time without fatiguing. They may contract in a wave-like manner, producing peristaltic movements such as those in the gastrointestinal tract and the male genital tract, or contraction may occur along the entire muscle, producing extrusive movements, e.g., those in the urinary bladder, gallbladder, and uterus. Smooth muscle exhibits a spontaneous contractile activity in the absence of nerve stimuli. Contraction of smooth muscle is usually regulated by postganglionic neurons of the autonomic nervous system (ANS); most smooth muscle is directly innervated by both sympathetic and parasympathetic nerves. In the gastrointestinal tract, the third component of the ANS, the enteric division, is the primary source of nerves to the muscular layers. Although most Ca2+ enters the cytoplasm during depolarization by voltage-gated Ca2+ channels, some Ca2+ channels, called ligand-gated Car ' channels, are activated by hormones. Thus, smooth muscle contraction may also be initiated by certain hormones secreted from the posterior pituitary gland (e.g., oxytocin and, to a lesser extent, antidiuretic hormone, ADH [see page 657J). In addition, smooth muscle cells may be stimulated or inhibited by hormones secreted by the adrenal medulla ( e.g., epinephrine and norepinephrine). Oxytocin is a potent stimulator of smooth muscle contraction, and its release by the posterior pituitary plays an essential role in uterine contraction during parturition. It is often used to induce or enhance labor. Many peptide secretions of enteroendocrine cells also stimulate or inhibit smooth muscle contraction, particularly in the alimentary canal and its associated organs. 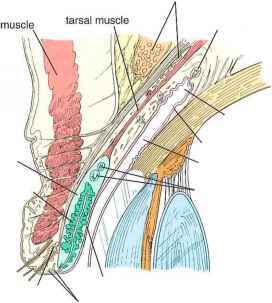 Nerve fibers pass through the connective tissue within the bundles of smooth muscle cells; enlargements in the passing nerve fiber, or bouton en passant (see page 289), occur adjacent to the muscle cells to be innervated. The enlargements contain synaptic vesicles with neuromuscular transmitters. However, the neuromuscular site is not comparable to the neuromuscular junction of striated muscle. Rather, a considerable distance, usually 10 to 20 ¡jlm (in some locations, up to 200 /xm), may separate the nerve terminal and the smooth muscle. The neurotransmitter released by the nerve terminal must diffuse across this distance to reach the muscle. Not all smooth muscle cells are exposed directly to the neurotransmitter, however. As discussed above, smooth muscle cells make contact with neighboring cells by gap junctions. As in cardiac muscle, contraction is propagated from cell to cell via gap junctions, thus producing coordinated activity within a smooth muscle bundle or layer. The gap junction between two smooth muscle cells was originally designated a nexus, a term still in use. Smooth muscle cells have organelles typical of secretory cells. A well-developed rER and Golgi apparatus are found in the perinuclear zone. Smooth muscle cells synthesize both type IV (basal lamina) collagen and type III (reticular) collagen as well as laminin, elastin, and proteoglycans. Except at the gap junctions, smooth muscle cells are surrounded by an external lamina. In some locations, such as the walls of blood vessels and the uterus, smooth muscle cells secrete large amounts of both type I collagen and elastin.